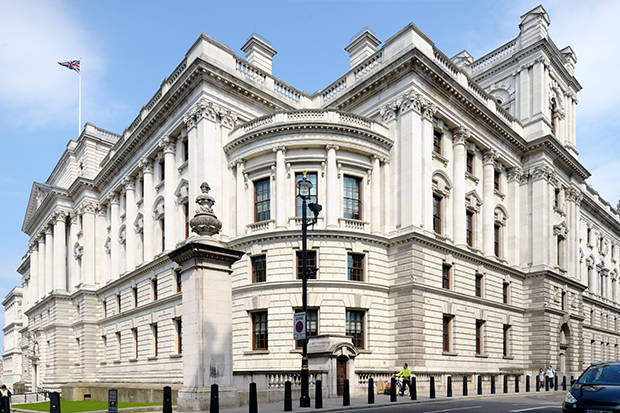 As government departments prepare for the 2019 Spending Review, the focus once more is on the perennial challenges of improving public sector productivity and measuring how taxpayers’ money is converted into the best results for the public. In 1998 the Treasury introduced the first Public Service Agreements (PSAs), in which departments agreed to targets in return for their spending review allocation. In the first decade of this century, Britain actually became a world leader in managing public money. In 2000 the Spending Review PSAs were refined, the number of targets reduced and the remaining targets refined. 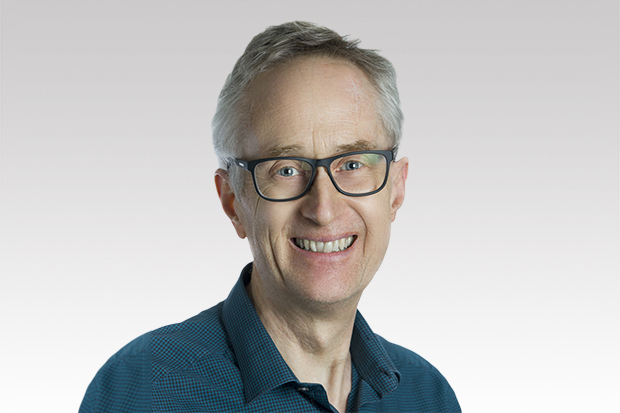 The following year, the Prime Minister’s Delivery Unit (PMDU) was established to work on priority targets, from among the PSAs, to bring visibility and challenge to how departments sought to deliver those targets. In successive Spending Reviews, in 2002 and 2004, this process was sharpened further. From 2003 the staff of the PMDU were located in the Treasury building, collaborating with Treasury colleagues in a concerted effort to deliver improved outcomes for citizens across the whole of public expenditure. No one would pretend this process was perfect. There were some poorly designed targets, some weak data collection processes and ongoing complex debates about areas of activity that weren’t priorities. But overall it worked and worked well. It helped deliver outcomes – significantly reducing crime, improving railway performance and, perhaps most significantly, dramatically reducing health waiting times. There was widespread international recognition of this from, for example, the IMF. However, these successes were achieved in a time of rising public expenditure and there was less focus than there should have been on controlling expenditure and ensuring efficiency. After the financial crash of 2008, public expenditure came under intense pressure as the British (and other) governments sought to stave off catastrophe both by bailing out some banks and reflating the economy. As a result, in 2010, the incoming coalition government found itself, of necessity, seeking not just to control public expenditure but to reduce it. Prime Minister David Cameron, Chancellor George Osborne and Francis Maude in the Cabinet Office took drastic measures. These included reducing the number of civil servants, capping pay rises for all public servants, radically reforming procurement and selling off government estate. In their own terms, these efforts were highly successful. Again, the British became widely admired by governments around the world: while others talked about gripping public expenditure, the British got on and actually did it. As with the previous decade, this phase was not without problems. It was crude, if effective, and sometimes prioritised the short term at the expense of the long term. But there were also enduring successes above and beyond the reduced expenditure totals – the Government Digital Service, for example. And the Civil Service itself became both increasingly diverse and more effective under the inspiring leadership of Jeremy Heywood. The major drawback of this phase, however, was the loss of focus on outcomes for citizens. PSAs were abolished, as was the Delivery Unit, while the Treasury, understandably, focused on being frugal – which is, of course, one of its core purposes. In 2016, the Chancellor, Philip Hammond, and his then Chief Secretary David Gauke decided to address this problem. They asked me to produce a report on efficiency and public value that would draw together the successes of the previous two decades, combining a continuing focus on controlling expenditure with a renewed emphasis on delivering outcomes – real value – for taxpayers. The Chancellor emphasised throughout that, while there had been some successful efficiency reviews in the past, they had all been “episodic” – here today, gone tomorrow. This one, by contrast, needed to change the way the Treasury did its core business. It was an opportune moment to examine public value. For the first time since Margaret Thatcher left office, both the PM and the Chancellor had experience of being Secretaries of State in large spending departments. They knew what it was like to be on the receiving end of the Treasury during a period of austerity. Liz Truss, who became Chief Secretary (on David Gauke’s appointment to the Department for Work & Pensions), while my report was being written, had similar experience. All were interested in permanently improving the quality of the relationship between the Treasury and spending departments. My report, developed with an outstanding team of Treasury officials, was published alongside the 2017 Budget. Its chief proposals were as follows. The ultimate goal of the framework would be for each department to show how it would use its spending allocation to deliver outcomes through all four pillars: pursuing goals, managing inputs, engaging users and citizens, and developing system capacity. And for this combination to represent a broader and more practical definition of public value than Britain (or any other country for that matter) has ever had before. Each of the four pillars makes a different contribution and, taken together, they make a coherent whole. The first two pillars are the culmination of the history I have recounted. The first relates to delivering defined outcomes within a defined period, and the second to checking that budget is spent on what it is intended for, and spent both rationally and efficiently. The third pillar brings in the relationship between the citizen and the state. It is not about polling popularity. It is about checking that public expenditure has legitimacy from the taxpayers’ point of view, and that where the quality of a public service depends on the relationship between user and service, this relationship is consciously developed. In this context, we should consider health outcomes and diet, or the role of the passenger in ensuring security on the railways. If we strengthen this relationship, more value will be delivered at minimal, perhaps no, extra cost. The fourth pillar is there because value for the public isn’t just short and medium term – it is also long term. Through the framework we aimed to encourage public servants, everyone from headteachers to permanent secretaries, to aim to leave the institutions they manage in a better condition than they found them. This is stewardship, and it is fundamental to long-term value. Explicit recognition of this has been entirely missing in spending allocation and monitoring. 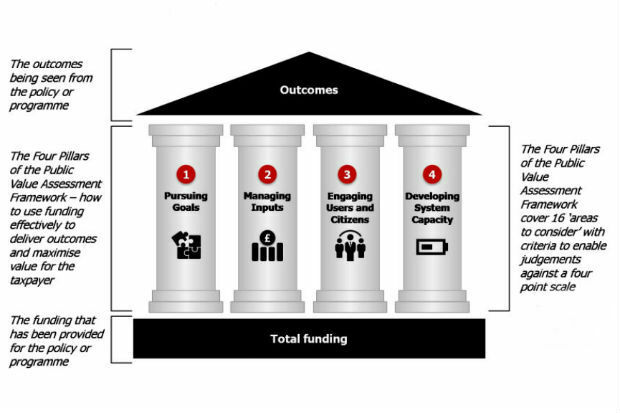 Behind the pillars lies the detail set out in the Public Value Framework, which is designed to enable the Treasury and departments collaboratively to review large budgets and see how they might create extra public value. The Treasury team piloted the framework in several departments during 2018. Generally, the pilots have been successful, improving with experience. We will soon publish an updated, simpler, clearer framework, with new advice on how to apply it. In any spending proposal, each department should spell out the data it will gather and analyse to check progress towards outcomes. In short, data systems should come as standard. Once data is flowing, departments should be able to deliver marginal gains in improved performance continuously, without extra funding. In any departmental spending review proposal, the Treasury should expect to see one or more areas where the department proposes not just marginal gains but disruptive innovation, perhaps through applying technology to a process. Such change should deliver significantly improved outcomes at significantly reduced cost. In November 2018 the National Audit Office (NAO) criticised the Treasury for not paying sufficient attention to the delivery of outcomes from public expenditure. I hope I have shown that the Treasury has been aware of this issue for some time, and has been preparing to step up to the challenge from the NAO. In preparing for the 2019 Spending Review, the Treasury is considering how the Public Value Framework and the other recommendations in my report might inform the structure and process of the review. We can expect a renewed emphasis on outcomes and how progress towards them might be pursued and monitored. The Public Value Framework is potentially a major advance on both delivery, under Tony Blair, and expenditure control, under David Cameron. This is, firstly, because it brings both together and, secondly, because the inclusion of the third and fourth pillars expands what we understand by public value. 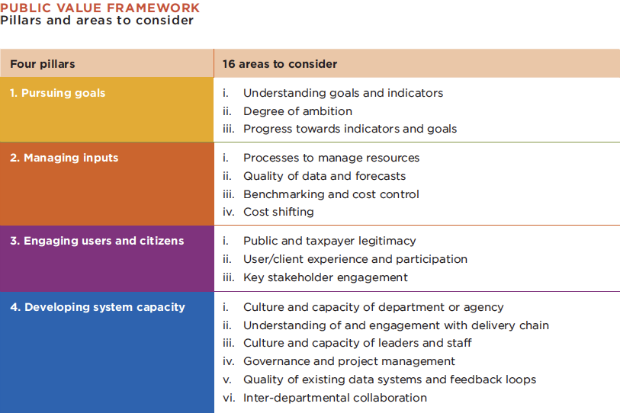 A government department that demonstrably pursues all four pillars will be able to show that it is not obsessing about short- and medium-term goals and spending efficiency – important though these are – but seeking to build legitimacy (pillar 3) and exercise stewardship (pillar 4). This would be a major underlying reform of the way public expenditure is managed. It would be radical, practical and world-leading. More importantly, in an era when citizens internationally are reluctant to pay more in taxes and determined to see value for money, it could build public confidence in how the country’s affairs are managed. That would be a major prize. Efficiency reviews would cease to be episodic, exactly as the Chancellor has urged, and the relationships between Treasury and departments put on a firmer and more rational footing. Above all, we would have created the foundation for an ongoing, informed public dialogue about what public money should buy and whether it is being delivered. As the world leader in managing public spending, Great Britain has held its Treasury and Government Departments responsible for public spending, which is obvious from the present document. It was a pleasure to read that the process of delivering public value had to have drawn on the academic work on public value. Four aspects in spending allocation satisfied, the further processes in accounting for expenditure were measured while delivering the defined outcomes and checking the expenditure with respect to four pillars. This description alone permits to see how responsible the persons in charge were and how accurately public expenditure was measured "to build public confidence in how the country's affairs are managed". This brief summary impresses the reader of the complexity of and responsibility in managing the country's public expenditure. It also explains why drastic measures were resorted to to manage the budget in a disciplined way. If ordinary people were familiar with the state budget and the work its management entails, they would be more considerate rather than resorting to industrial actions. Thank you.